Side 1 printed with 1 PMS color using light coverage. .015 gauge Royal Blue Poly stock uncoated. Vibrant blue poly panels give this design an electric style. The Renaissance Charter School at Cooper City logo is central to the cover; its pale gold ink reflects the school's other color and softens the design's intensity. 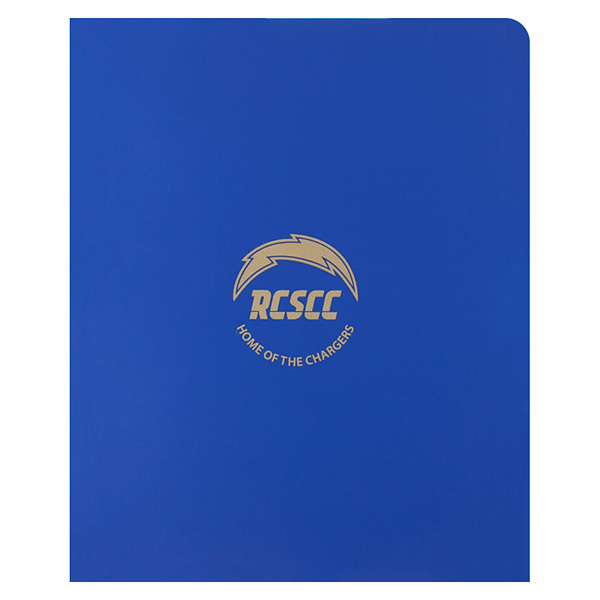 The poly folder is a great choice for students, since its plastic panels are virtually indestructible. Inside, labeled pockets sort papers into "Take Home" and "Bring Back" categories to help kids stay organized. Manufactured from sturdy Polyethylene, this product resists the wear and tear to keep your design looking great for a long time. Its plastic shell protects the 8 1/2" x 11" print media stored in its two interior pockets. Standing 5" tall, two deep pockets are sonic welded on the outer edges for maximum durability. To add a bit of flair, both pockets drop off at a steep angle toward the spine. This unusual shape captures users' attention, making the pockets the perfect canvas for branded design elements. Dimension Closed: 9 1/2" x 11 1/2"
Dimension Open: 19" x 11-1/2"